Eight Ball Deluxe Macintosh version was released by a Canadian company AMTEX Corp. in 1993. It is a Macintosh version of a best seller real arcade pinball from Bally. So it was developed under license of Midway Manufacturing Company. It was a best seller in Macintosh gaming world too, won prizes such as 1993 BEST SIMULATION GAME FINALIST award of Software Publishers Association(USA). We've been receiving many requests for releasing Eight Ball Deluxe to date. However, as AMTEX had gone out of business and we have to get the license again from Bally which seemed not affordable, we were compelled not to release it by ourselves. 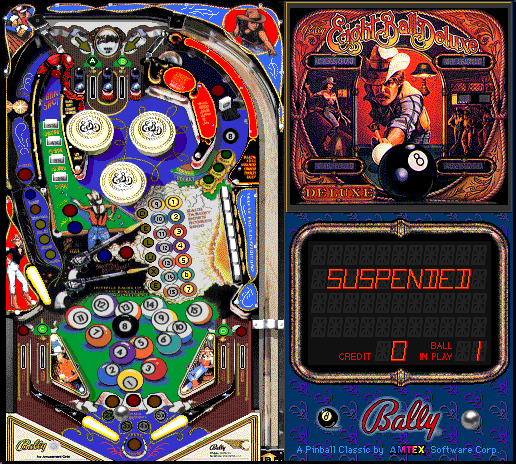 Also Bally has quit making pinball several years ago. Now that we have no idea who owns the license. To our surprise, it is still on the second hand market. Of course they haven't got any update. We are impressed and so happy some people still love this title and play it with antique Macintosh. It's awesome. PC version was developed shortly after Macintosh version. However, it was not our work. We remember Mark, the president of the company which developed the PC version composed the groovy opening tune with his banjo in front of us, just for five minutes! For some reason, there is no credit about the great tune. In '80s, there was no memory to store a whole song in an arcade pinball machines therefore, the tune was just for digital versions.